The New Year period is a busy time for Noh actors! 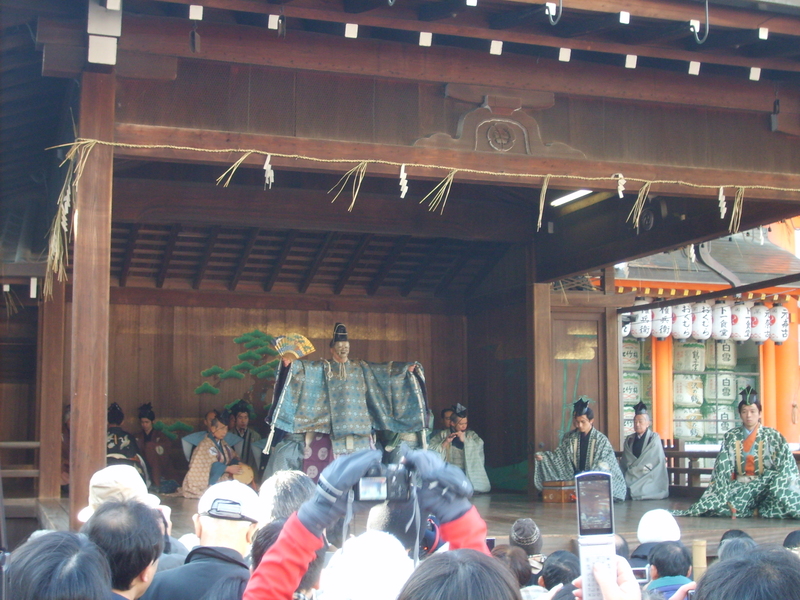 Augural plays wishing long life and happiness are performed at various locations, especially Shinto shrines. If you are in Kyoto during the first week of January 2016, I recommend that you check out these FREE Noh performances. January 1st Friday from 12:30 @Heian Shrine. 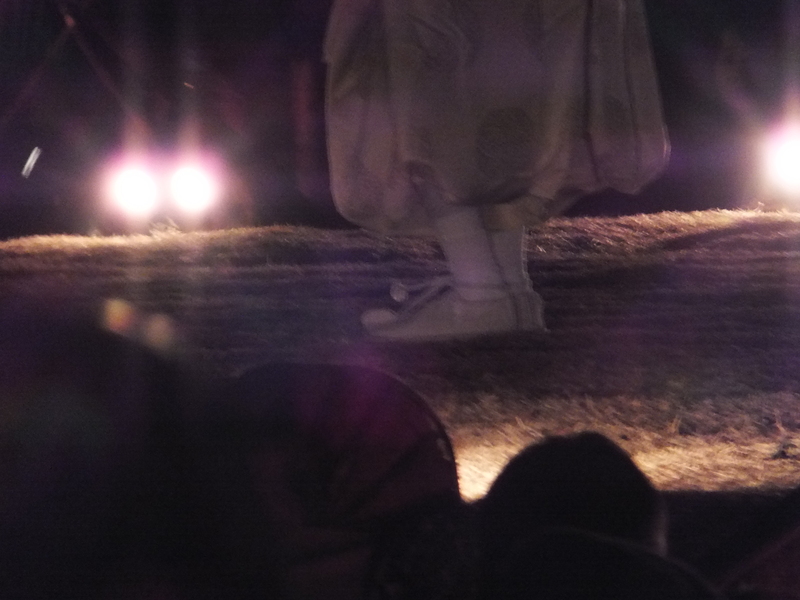 Ritual Noh performance. Okina. Shite: Kongo Hisanori. January 3rd Sunday from 09:00 @Yasaka Shrine. Okina. Shite: Katayama Kuroemon. Shimai: Tsurukame. Shite: Kongo Hisanori. January 3rd Sunday from 12:30 @Kongo Noh theatre. First performance of the year. Recitation of the chant of Okina, shimai and maibayashi (Iwafune Shite: Kongo Tatsunori). 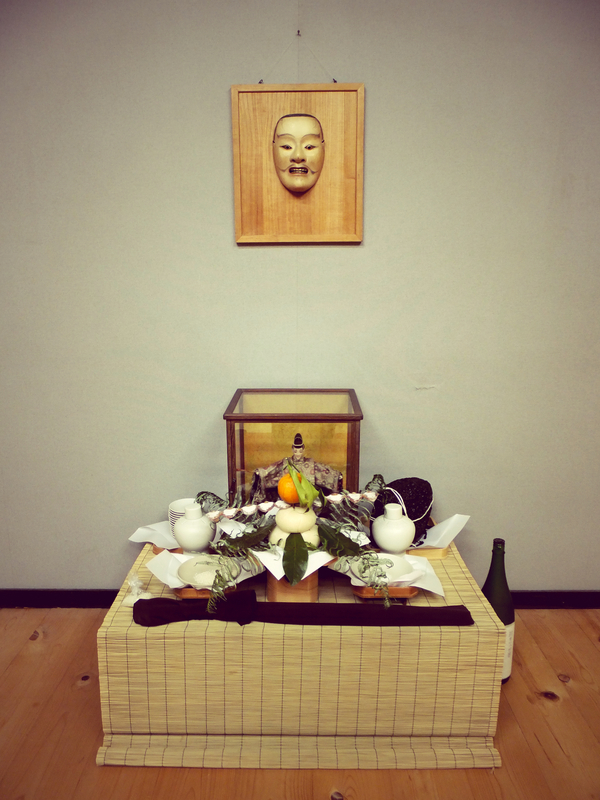 Every year at this time of the year Udaka-sensei performs a brief ritual of purification of the butai, the stage on which he and his students practice during the rest of the year, at the okeikoba practice space. 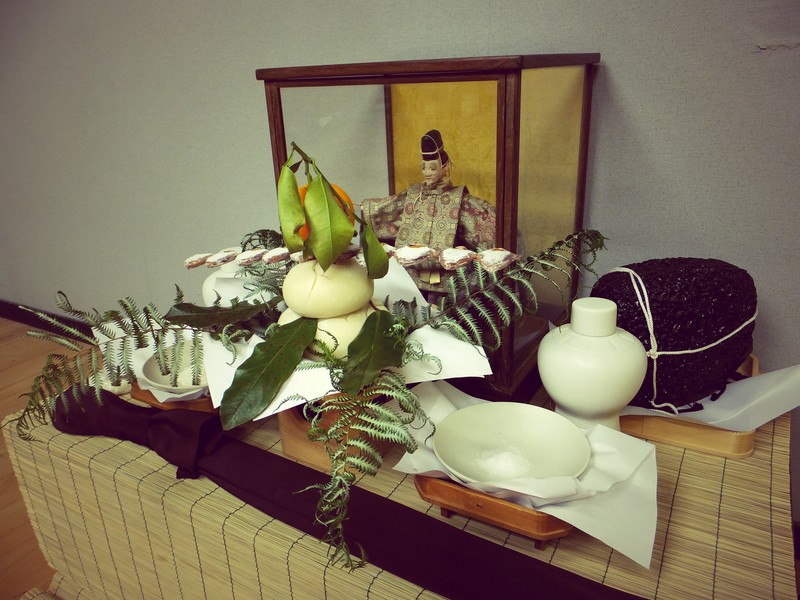 As you can see in the pictures, a small altar with an Okina doll and various offerings (rice cakes, mandarins, uncooked rice, salt and rice wine, etc.) is set up at the back of the stage. During the ceremony omiki, a ceremonial sacred cup of wine, is also served. This ceremony derives from shinto practices associated with the New Year, where various places or objects are blessed or purified, getting ‘refreshed’ for the new year. From a secular perspective, I found this ritual very meaningful. The practice space is not a place like any other. Theatre practitioners such as Stanislavski and E.G. Craig wrote it in red letters in their notes. The stage is like a workplace, one that is shared with others. It is a space for meeting and transmission of knowledge. The stage demands respect. Much of what happens on stage would not be convincing without the necessary amount of concentration and tension. We treat the stage like an ‘other’ place, for example we don’t walk on it without wearing white tabi socks, or we don’t sit on its edge – all this informs our conscious and unconscious awareness that the stage is not like any other place, and this results in an heightened state of tension when performing on it. The theatre stage is charged by the gaze of all those who look at you when you perform on it, but the private practice space needs extra attention in order to perceive at least some of the emotions you feel when you go on stage. That is why we need to respect our practice space, whatever it is, wherever we are. A true priest is aware of the presence of the altar during every moment that he is conducting a service. It is exactly the same way that a true artist should react to the stage all the time he is in the theater. An actor who is incapable of this feeling will never be a true artist. Kagura-shiki: the ji-utai chorus seen from the back. On the left, the temporary shrine where the god resides. On Sunday 24th of November a special celebratory event marked the 10th anniversary of the construction of the new Kongō Nō theatre, in Kyoto. The old theatre in Muromachi-street was a landmark in the history of Kyoto Noh, as it was the only stage rebuilt after all three main stages in Kyoto were burnt during the the Meiji upheavals. In 2004 the new state-of-the-art Kongō theatre opened on Karasuma street, in front of the imperial palace. I never had the pleasure of visiting the old theatre, but I heard many stories about it from actors in the school. 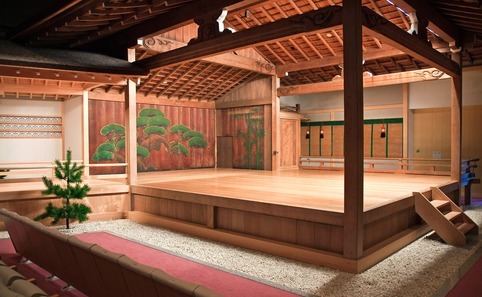 It still had tatami mats instead of chairs, and large windows that let warm daylight illuminate the stage, across clouds of tobacco smoke lifting from the back seats. There, important guests would be able to sit in privacy, hidden behind lowered bamboo curtains, which they would lift only to watch the performance. Unfortunately the building did not conform to the modern health & safety (and fire protection) standards, and had to be demolished. The Shin-Kongō Nōgakudō (New Kongō Nōgakudō) is one of the best Noh theatres I have ever visited. 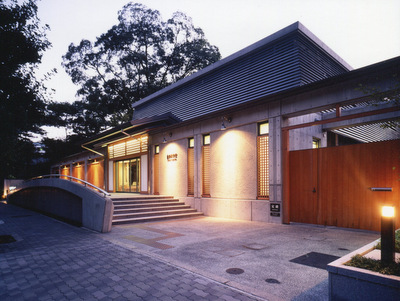 The design style of the building mixes traditional and modern, wood and concrete, in a unique blend that creates an atmosphere that is not too relaxed, nor too intimidating. It has comfortable armchairs (but not too dangerously comfortable), and the temperature usually is just right, unlike other places where you either freeze or steam. 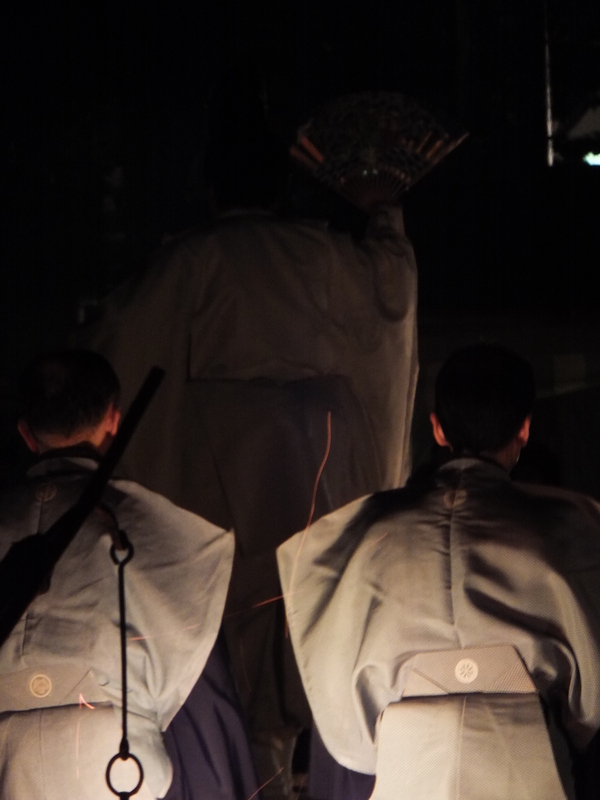 Sunday’s performance opened with a special variation of Okina a ritual performance celebrating long and prosperous life. In this variation, called jūnitsukiōrai, the Iemoto Kongō Hisanori and his son Kongō Tatsunori took the roles of two Okina exchanging verses describing the characteristics of each lunar month. The choice of the variation was excellent because it emphasises the cycle of time and seasons with both the Kongō father and son on stage, symbolising the generational transmission of the Kongō heritage. It closed with a final left-right salutation from Kongō Tatsunori, who will be the future Iemoto. 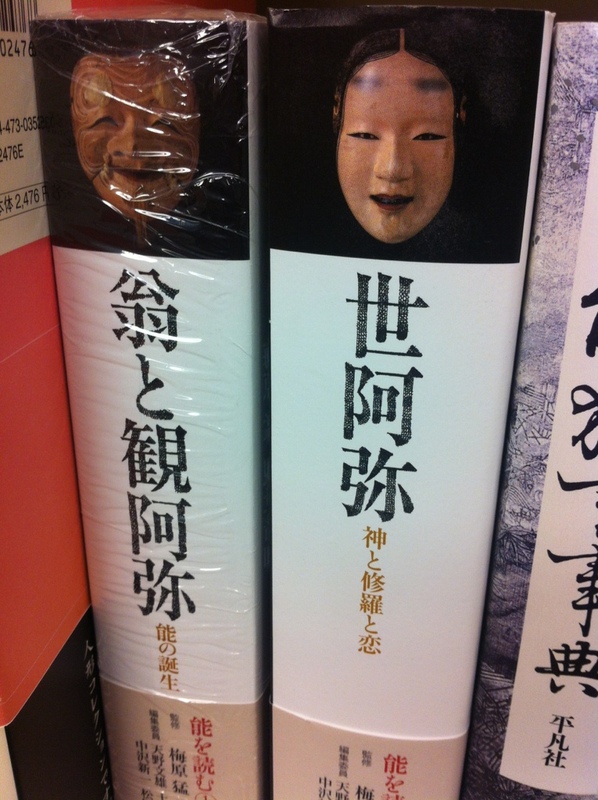 The maibayashi extracted from the Noh Ema featured three of the senior Noh actors in the Kongō school, Teshima Michiharu, Imai Kiyotaka and my teacher, Udaka Michishige, who took the strong role of the god Tajikarao, pulling the Sun-Goddess Amaterasu out of the cave where she was hiding. Hagoromo (shōgi no monogi variation) featured the beautiful ‘phoenix robe’, a costume only worn by the Kongō Iemoto. In this variation the tennyō (celestial maid) dons the costume while sitting on a stool in the middle of the stage. Shakkyō (The Stone Bridge) concluded the long day of performances, with Kongō Tatsunori taking the role of the lion (an avatar of the Bodhisattva Manjusri) frolicking among white and red peonies. Yesterday I went to see Dengaku to Sarugaku at the National Bunraku Theatre in Osaka. Two groups, the Nachi Dengaku Hozonkai (Nachi, Wakayama pref.) and the Nara Tsuhiko Jinja Okina-mai Hozonkai (Nara) preserve ancient traditions that are thought to predate the performing art we call Noh today. Dengaku (literally ‘field entertainment’, where ‘field’ refers to ‘rice paddy’) is a form of performance where musicians playing taiko and sasara (a kind of wood clapper) dance in symmetrical patterns, at the accompaniment of extremely simple and repetitive musical patterns. Movements mime sowing the fields, evidence of its original purpose of propitiating good crops. Sarugaku (debate is open on the literal meaning of this word) is the old appellation of what we now call Noh. On this occasion the Tsuhiko-jinja troupe performed Okina-mai, a predecessor of the contemporary Okina performed by Noh actors. I won’t get into the discussion on the ‘authenticity’ of such dances – forgive the superficiality of this post. What can I say about the performance… I took extensive notes. Mostly because I was very bored. As I was looking around, noticing how many people around me were dozing off, I thought of Peter Brook’s ‘rough theatre’ misplaced in a ‘serious’ situation, and of Rustom Bharucha’s talk of ritual performance as something that cannot be detached from its original context. Technically speaking performances such as those I attended today require to be performed at a shrine, on a lawn, in the presence of many people surrounding the performers, chatting, taking pictures, eating, sleeping, moving around.. a ‘rough’ setting. I think that one of the reasons behind the reiteration of simple dance and music sequences is the need to offer a performance that can be ‘followed’ even if distracted or interrupted, something very different from a theatre hall performance, where the audience is sitting, forced to stare at the stage, as we were today. Moreover, yesterday’s performers were amateurs, whose lack of technique is all the more evident on a ‘proscenium arch stage’. As I wrote on my notes, religious performance contains values transcending the aesthetic: when it’s placed on a theatre stage it loses all true ritualism. All that is left is art, and art requires technique, not belief. A bit of a random post. Cycling in the snow this morning reminded me of Mishima’s Spring Snow which I am reading these days. In one of the salient passages of the book, set in the Taisho period (1912-1926), the protagonists Kiyoaki and Satoko take a rickshaw ride on a snowy morning in Tokyo. Covered with various layers of technologic fibre from top to bottom, and still shivering while waiting for the green light at the bicycle crossing, I imagined Kiyoaki and Satoko riding the rickshaw, him dressed in his school uniform, her in a winter kimono and coat, with only a blanket on their knees as additional warming device. In this scene the two exchange their first kiss, as frosty hands move underneath the blanket. With this kind of temperature it would be the last thing I want. Then I realised that people can stand different temperatures according to the environment in which they grew up. Japanese students today still wear shorts in winter, and some girls still wear a skirt and short socks. British people would go out in their t-shirt on a sunny but cold february day. Not to mention what girls would wear on the same night out. 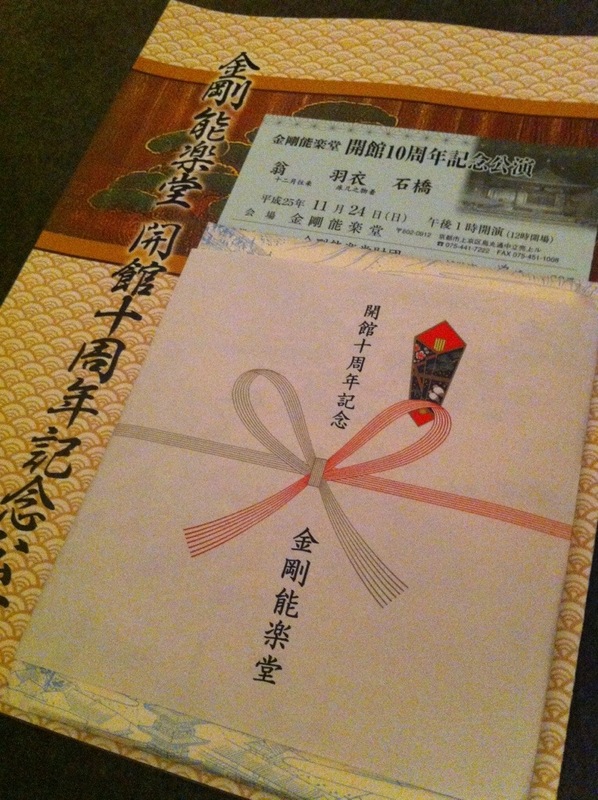 Two years ago I attended the performance of Okina performed by the Iemoto Kongo Hisanori at Yasaka-jinja in Kyoto. 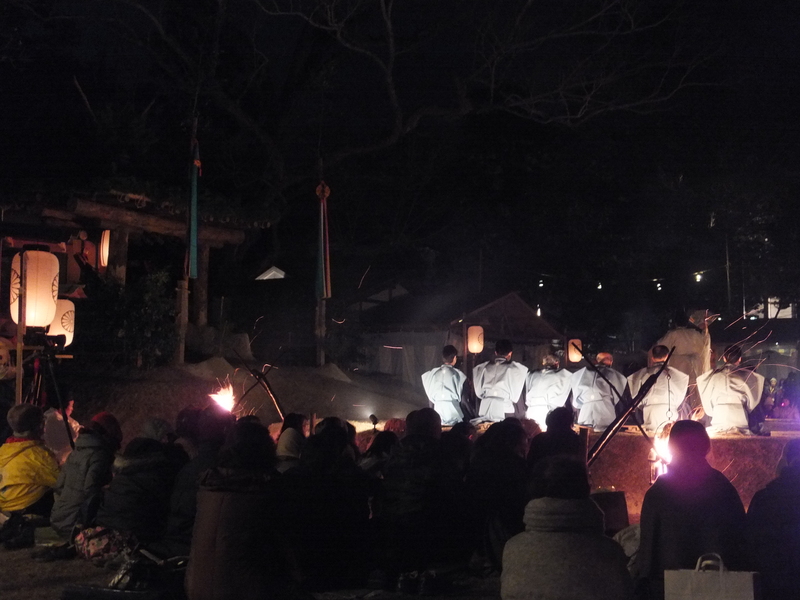 I think it was January 3rd and I was observing chorus members sitting in the back of the outdoor stage, dressed in traditional clothes… and I was wondering how many Uniqlo heat-tech garments or kairo heating patches they were actually wearing. This year I am spending my first new year period (お正月) in Kyoto. Although the temperatures seemed to be slightly higher than London (recently hit by a blizzard that seriously threatened my departure by having Heathrow and Gatwick shut for a few days), I reached Kyoto once the weather changed here too. We had rain, cold winds, snow and all that comes with the rigours of winter.